Urban Social, new generation hotelier concept, is first introduced at AKRA, one of the best hotels Antalya has to offer. Named “Life Style Hospitality,” this principle prioritizes the sensory; it all begins with “Touch,” i.e. the first impression you have the moment you step into the hotel. Taste, Smell and Sound are followed by “Well-Being” which can be defined as the most important element of the new generation hospitality code. In other words, this hotel turns holidays into a process that heightens your senses. Collaborating with experts to stir guests’ senses and offer them unforgettable memories, AKRA Hotel partnered with master perfumer Christophe Laudamiel, one of the world’s top 10 scent experts, for the “Smell” code. Throughout their stay, guests can breathe in the exclusive fragrance designed for AKRA by Laudamiel, immortalizing their memories of the hotel. Chef Tolga Atalay is responsible for the “Taste” code at AKRA, selecting and reinterpreting dozens of delicacies from Turkish and world cuisines. Food resembles artwork at Pablito and Asmani, two individually decorated restaurants at the hotel. Keep in mind that Asmani serves dishes prepared with daily ingredients. The “Sound” code that will carry the holiday experience to a higher level results from a collaboration between AKRA and renowned DJ Suat Ateşdağlı. His exclusive playlists for each section of the hotel accompany guests 24/7. Featuring a spa with massage and therapy rooms, semi-Olympic indoor and outdoor pools, the LifeCo Detox Center and Saf Restaurant, AkraFit is the “Well-Being” element of the hotel’s new generation service policy. 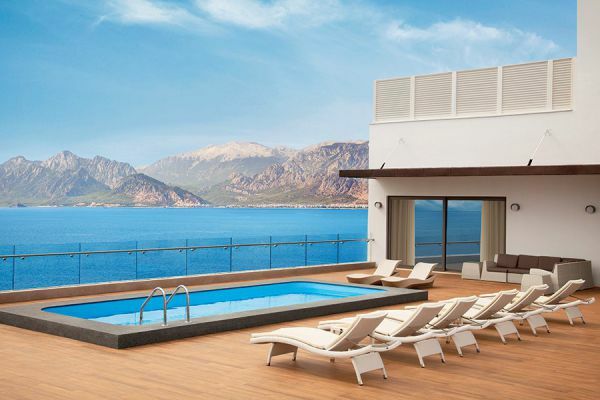 AKRA’s peerless view overlooking the sea cliffs, Beydağları mountain range and the Mediterranean awaits visitors as a spectacular background for their photographs.